Rock radio juggernauts POP EVIL have announced a final batch of tour dates to cap off the most memorable year in the band's history. The aptly named SET IN STONE TOUR will kick off on November 28th in Bloomington, IN at the legendary Castle Theater and run through December 20th, capping off the tour with a final hometown show in Grand Rapids, MI. Support duties will come from RED SUN RISING, ISLANDER and LETTERS FROM THE FIRE. Tour dates are listed below. The tour has extra meaning for the band, rounding out a year which gave them their latest LP Onyx, which recently surpassed 100,000 copies sold domestically - a feat not easily accomplished in the current state of rock. “For the past year and half we have taken POP EVIL to new heights with Onyx," says frontman Leigh Kakaty. Onyx produced three number one singles at Active Rock Radio with its tracks "Trenches", "Deal With The Devil" and "Torn To Pieces". Kakaty concludes, "It’s now time to conclude this incredible journey and prepare for the next chapter in 2015! We are looking forward to celebrating our biggest album yet and seeing everyone out on the up coming tour to share in the festivities!" POP EVIL released Onyx, their third studio LP last year and has taken the band on their wildest ride yet. The LP debuted at #39 on the Billboard Top 200 and #9 on the Independent Chart. The band recently released a Deluxe Bonus Edition and is available exclusively through Best Buy. The band attributes their success to non-stop hard work, constant touring and writing great songs. 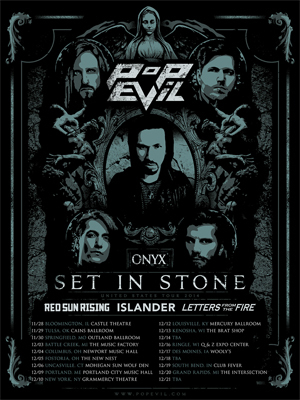 POP EVIL "Set In Stone Tour"